We opted for flavoured lattes, mocha and caramel respectively. A decent latte, on a par with McDonald’s we agreed – although the taste between the two was minimal despite the radically different flavours we had chosen. As for the meal, we ordered a bacon, egg and cheese muffin which came with a generous abundance of petite hash browns. The Muffin was ok, not quite an egg Mcmuffin which is of course, delectable perfection guaranteed to cure any hangover and brighten any morning. 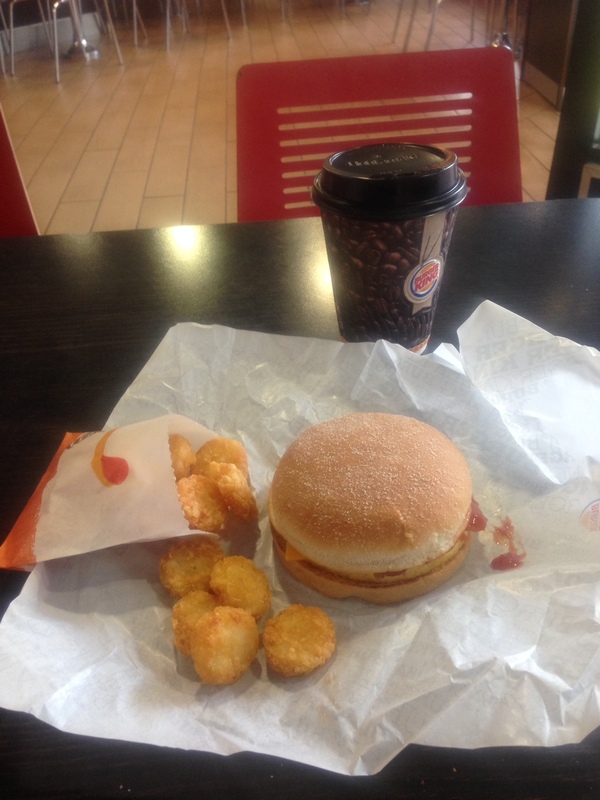 Nay, Burger King’s offering lacked Mcdonald’s Mcmuffin’s saltiness and texture, but was still very passable. The bun was very boring, almost Subway esque. The hash browns we felt ambivalent about as we started them, but when we got to the last few we concurred that they were utterly addictive. At £3.49 for the meal, (hash browns with a muffin on the side) we were astounded by how right the price was in comparison to the gold flaked double bacon cheese burger meal we harvested our organs for many moons ago. The price is right and we shall be returning – if there is no McDonald’s in the vicinity.